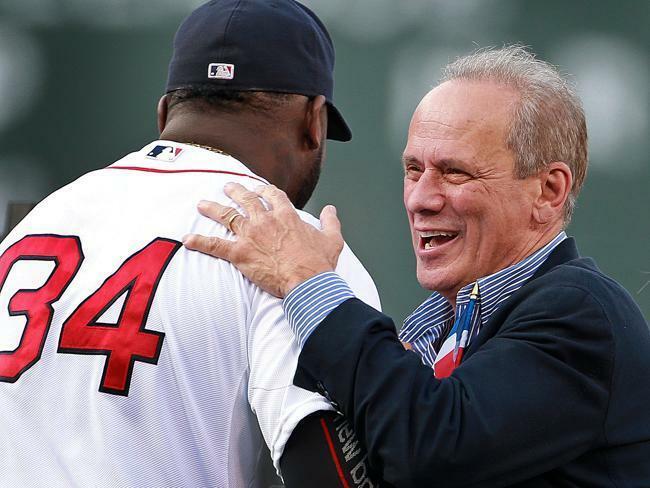 Red Sox president and chief executive Larry Lucchino greeted David Ortiz at the Pedro Martinez jersey retirement ceremony last week. Lucchino said Saturday that he’ll retire from those posts at season’s end. Red Sox president and chief executive Larry Lucchino said Saturday he will be stepping down at the end of the season, ending a remarkable 14-year run that saw the team win three World Series titles in 10 years. Lucchino’s departure will break up a famous ownership trio that also includes John Henry and Tom Werner. Lucchino said his role as club president will be filled by Sox executive vice president and chief operating officer Sam Kennedy. Lucchino said he started to plan for the day he would leave the Red Sox back in 2004. Kennedy would take on only one of Lucchino’s roles, that of club president. According to sources close to the Red Sox, Werner is interested in taking over as the club’s chief executive. Werner, the club chairman, has been playing a more prominent role with the Sox. Henry, the principal owner of the Sox and also the owner of the Globe, told WBZ that Lucchino “is a Hall of Fame baseball executive who has left an indelible mark on Fenway and the relationship between the Boston Red Sox and New England.” Henry also indicated his support for Kennedy’s moving up as club president. Henry did not respond to e-mails from the Globe Saturday evening. 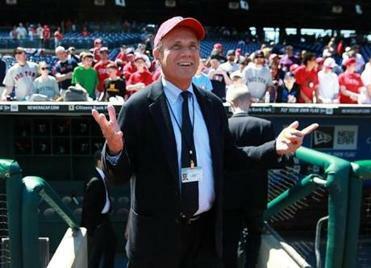 Lucchino has been in Major League Baseball since his mentor and boss, Edward Bennett Williams, bought the Baltimore Orioles in August of 1979. Lucchino won a World Series ring with the Orioles in 1983 and in 1992 oversaw the construction of Camden Yards, which changed the way big league parks were built. After leaving the Orioles, Lucchino ran the San Diego Padres for seven seasons and orchestrated the building of Petco Park. Lucchino joined Henry when Henry purchased the Red Sox in December of 2001 and directed the $200 million renovation of Fenway Park. The ever combative Lucchino’s hard-charging style infuriated Yankee owner George Steinbrenner and many other owners, agents, and big league ballplayers. While running the Padres, Lucchino hired Brookline High School classmates Theo Epstein and Kennedy as interns. When Henry’s group was awarded the Red Sox, Lucchino brought both young talents to Boston. Epstein became the youngest general manager in the history of baseball at the age of 28 in 2002, and under Lucchino and Epstein, the Red Sox broke an 86-year curse and won the World Series in 2004. Lucchino was instrumental in the recruitment of Curt Schilling and many other baseball transactions during the Red Sox’ playoff run of the 21st century. He is also believed to be the man who blew up negotiations with free agent Mark Texeira, who signed with the Yankees before the 2009 season. It was a feud with Lucchino that provoked Epstein to resign after the 2005 season. Epstein returned before the 2006 season, and the Sox won the World Series for a second time in 2007. Lucchino’s clout in the Sox front office appeared to wane after the collapse of 2011 and subsequent firing of popular manager Terry Francona. After the resignation of Epstein in the winter of 2011-12, it was Lucchino who overruled new GM Ben Cherington and hired Bobby Valentine as Sox manager. In the spring of 2014 Lucchino lowballed free-agent-to-be Jon Lester, and Lester was eventually dealt to Oakland at the trading deadline. Most recently, Lucchino has been in charge of the proposed relocation of the Sox’ Triple A franchise from Pawtucket to Providence. According to multiple sources, the Red Sox have been planning the transition from Lucchino to Kennedy for years, with conversations about Lucchino concluding his term at the end of 2015 going back at least a year. Kennedy had been offered a number of positions in baseball and other sports, including with the Toronto Maple Leafs and NBA organizations, one team official said. To avoid losing Kennedy, the Sox assured him when he signed his most recent contract in 2012 that he would be elevated to the level of president when Lucchino stepped down. While Kennedy will gain the title of team president, the precise dimensions of his job responsibilities are less clear. Lucchino, meanwhile, remains an equity partner of the Sox ballclub and expects to remain a part of the front office in a different role. The Sox do not yet have the framework of a new deal with Lucchino, officials said. They have had discussions with him about assuming a different role that moves beyond his current involvement in day-to-day operational details to broader strategic conversations, both with the Red Sox and as a party to conversations with Major League Baseball. Globe reporter Alex Speier contributed to this article. Dan Shaughnessy can be reached at dshaughnessy@globe.com. Follow him on Twitter @dan_shaughnessy.